The Savannah Branch of The Leukemia & Lymphoma Society Georgia Chapter announced its Man & Woman of the Year at their campaign’s Grand Finale Gala at the Charles H. Morris Center. Twelve local Savannah community leaders — six men and six women — have been competing with each other for the last ten weeks to raise the most money for LLS. In its second year, the event raised $307,765, exceeding the original goal by $87,000. Michael Caputo with Starkey Mortgage, was named the 2014 Man of the Year, raising $70,666. Jessica Neeley with Workmen’s Circle Credit Union was named the 2014 Woman of the Year, raising $27,435. “We were pleased to recruit such an outstanding class of candidates for this campaign. While only two people are awarded the titles Man & Woman of the Year, we are extremely proud of all of our candidates. Due to their tremendous fundraising efforts we have raised critical funds to find a cure for blood cancers. We couldn’t be happier with their results,” said Cinda Baker, manager of the Savannah Man & Woman of the Year Campaign. This year, Will Gruver won the Mission Integration Award; the award to the candidate that demonstrated exceptional mission integration into their campaign. Julie Schwartz was awarded the Community Involvement Award; the award to the candidate that facilitated exposure in the community and built a strong program and team. Every dollar the candidates raised counted as one “vote” and the candidates with the most votes were awarded the title Man & Woman of the Year. 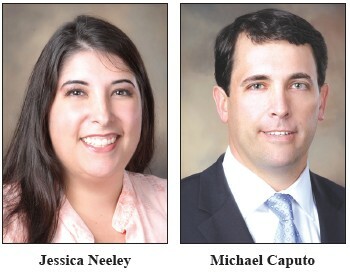 Woman of the Year Jessica Neeley and Man of the Year Michael Caputo will now be entered into the national competition for Man & Woman of the Year, which will be named in July. All the candidates competed in honor of LLS’s Boy & Girl of the Year, Tishaun and Rachel, local children who are blood cancer survivors and sources of inspiration to others. The 2014 Man of the Year nominees were: Michael Caputo of Starkey Mortgage; Patrick Connell of Ellis, Painter, Ratterree & Adams LLP; Spy Gibson of The Haskins Company; Will Gruver of TJS Deemer Dana LLP; Nick Rintye of National Railway Supply and Brian Stafford of Stafford Promotions. To learn more about the campaign, go to www.mwoy.org/ga.